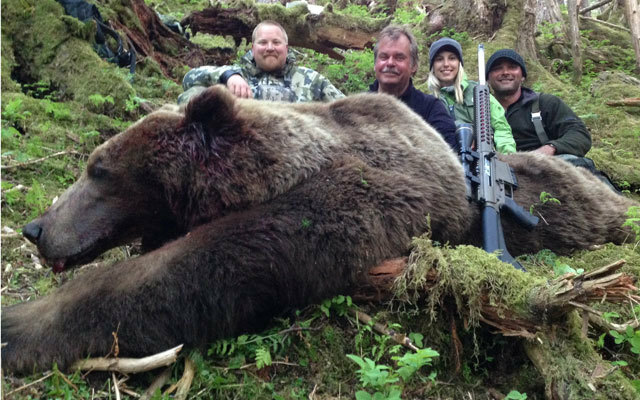 A grizzly-bear outfitter went looking for the perfect bear rifle and instead formed Alaska Magnum ARs, LLC. He now sells beautiful custom ARs mean enough to take down brown bears. This realization came to me not as an epiphany moment but more a gradual awakening after a fairly exhaustive search for the ultimate brown bear rifle. It all started one spring day a few years back along the coast of Alaska. A client and I were hunting brown bears from one of my 16-foot aluminum skiffs. We’d spotted a very large male bear eating sand fleas, which were trapped in the piles of kelp along the high tide line. The beach was wide open and featureless for several hundred yards on either side of the bear. We’d managed to motor past him to get downwind by staying a mile or so off shore, getting on step and moving fast. (My skiffs are quiet). These big males never stay on an open beach for long, so speed is of the essence. We’d beached the skiff and unloaded ourselves and our gear about 700 yards from the bear and out of sight. By staying just at the edge of the incredibly thick forest and hustling briskly, we were within about 300 yards of the bear as he started lumbering in our direction. I felt good about our position but not about the range. Unfortunately, getting closer was not an option. The beach was too open and the bear would absolutely see us if we moved forward. I knew from experience that there was a high likelihood the bear would turn and walk into the trees soon. I was actually surprised he hadn’t done so already. With the client and his .340 Weatherby in a steady, prone position and my own bolt-action rifle on the same log the client was using, I used a rangefinder to pick out a landmark that the bear had to get to to be within my self-imposed 200-yard maximum range limit under this particular set of circumstances. A small stream was 175 yards ahead. Close enough. I knew the likelihood would be for the bear to turn and wander up the stream and out of sight when and if he made it that far. It was unlikely he would continue beyond that point because the kelp didn’t continue to our side of the stream. Sure enough, the bear reached the stream, stared at it for a moment, then turned to his left and took a few steps toward the timber 30 yards away. Shortly, the bear stopped, lightly quartering away but broadside. I told the hunter to shoot him through the lungs. At the shot, I saw through my scope that the bullet had struck too far forward, obviously breaking the bear’s leg and going through his brisket. Not a lethal shot. As the bear stood on his hind legs, twisted and bit at his shoulder, I shouted, “Shoot him again” and got the best shot off I could. I hit the bear, but not through the lungs. The client fired and missed while I racked the bolt, hurriedly got the running bear back in the scope, and sent one into his hind end as he disappeared into the forest. Well, that could have gone better. I knew the bear wasn’t dead, but I also knew that we could likely find him if we played our cards right and let him lie down. Fortunately for us, it was a bluebird day and looked to be staying that way for a while. We needed to wait a day. This is the point that the “Better Bear Gun” light bulb started to flicker. I replayed the scenario in my mind, and it was pretty clear that had I been shooting an auto-loader, that bear would likely be dead on the beach. This brought back memories of other bears I’d had to track — and you know what? I could easily come up with several that would not have made the trees had I been able to deliver more than one or two rushed back-up shots with a cumbersome bolt-action rifle. At the time I was clueless about ARs. I’d always considered them to be plinkers or at best, coyote guns. Surely someone made a really effective AR with some real power? Boy was I wrong. Don’t misunderstand. We all know about the .458 SOCOM, the .450 Bushmaster and the .50 Beowulf. But are these really brown bear calibers? Absolutely not. No way. No how. What about the AR-10 type rifles and clones? The .308 is a good medium-game caliber. The .338 Federal is getting warmer. Still, no way was I deliberately choosing these calibers to chase 1,000-pound bears, especially not when they’re wounded and in the thick stuff. This wasn’t going to be easy. My benchmark was the .375 H&H. This is a brown bear caliber. This is THE brown bear caliber. I might fudge a teeny bit on power for effective follow-up shots, but not much. So began the trail that would lead to the founding of a firearms manufacturing company and a line of ammunition to go with the rifles: Alaska Magnum ARs, LLC. The first and easiest platform to work with was the AR-10 rifle. It was our intent from the get-go to modify existing parts designs and get them to reliable function with a cartridge case that could closely match the classic .375 H&H’s ballistics: a 260- to 270-grain bullet at 2,600 to 2,700 fps. This was the brown bear load I’d used for years and knew to be as reliable a bear killer as is possible. (Myself, as well as most of the professional guides I know, shoot this weight bullet in the H&H over 69-gr RL15 for about 2,600 fps depending on barrel length.) Each time I’ve fired this round into a wounded bear at close range the bear has dropped. Lights out. Done. This was the company the new guns had to run with. Magazine length was the biggest hitch in the giddy-up when we designed the new cartridge. We could go a bit fatter with regard to case dimensions, but not too much longer than what was already out there. We soon realized that all short, fat cases aren’t created equal. Many are not designed with enough wall thickness to reliably stand up to the stress of a bolt and carrier group slamming them into the meat grinder that is an AR’s barrel extension. Fortunately, we found a good starting point thanks to our good friends over at Hornady. They were an immense help throughout the R&D phase of the project, supplying us with the raw materials needed all along the way. So what did we come up with? How about the .375 Grizzinator? An AR-10 type rifle that fires a 260-grain bullet at 2,600 fps from a 22-inch barrel? Is it reliable? You bet. These rifles have been in the field in the hands of Alaskan guides for several years now without a single failure. I’m unsure how many big bears have fallen to the new rifles and calibers, but I do know that I’ve personally not had to track a wounded bear off a beach since I’ve made the switch. Considering this was not an uncommon occurrence previously, I’d say this is no mean feat. The AR-15 platform was an entirely more difficult critter to skin. The bolts, carriers and extensions are dainty. Opening the bolt face up to accept the rim diameters of the current crop of big-bore cartridges leaves very little material left, making for an operating system that cannot be pushed hard. This is fine considering that, at least with regards to the SOCOM and Beowulf, we are dealing with what amounts to large pistol brass, which is inherently weaker than rifle brass. Weak brass (.450 Bushmaster excepted) and a bolt face that has a marginal amount of material left was not a recipe for a powerful, high-intensity round capable of reliably killing large, dangerous game. The answer was two-fold: Base the AR-15 caliber on the same heavy-duty brass we’d developed and proven in the AR-10 type platform, and redesign the bolt, carrier and barrel extensions to handle the increased pressures and bolt thrust of the new round. We did just that. The .460 Grizzinator was born. It’s a short, fat cartridge that loads single-stack in unmodified AR-15 magazines and operates at around 50,000 CUP. This gives us ballistics better than the hot 45-70 loads and not a bunch behind the .458 Winchester Magnum with the lighter bullets. Our current go-to load is a 250-grain monolithic bullet travelling at well over 2,400 fps. While not a long-range caliber, it is grim death inside 200 yards; perhaps the quintessential “tracking wounded bears” gun. My wife Jana, full-time guide, Alaska Magnum ARs owner and bear killer in her own right, loves this combination. In a short, lightweight rifle, it gives one a sense of invincibility not afforded by many other rifle/cartridge combinations. What became of the big bear on the beach? Well, it wasn’t easy, but we did find him the next day. With myself in the lead with my open-sighted 16-inch-barrel .375 tracking gun and an assistant guide at my back, we tracked the bear through the patchy snow and thick forest for a couple of hours. Eventually, I could see where the bear had crossed a pretty good-sized open stretch of snow, maybe 25 yards across. I scooted rather quickly most of the way across the snow and stopped at the high point to look around, the assistant guide perhaps 10 feet behind me. From my left and slightly behind I heard a low grumbling growl and turned to see the bear hustling directly at me from about 15 yards away, his eyes intent on me. As I raised my rifle, the bear’s eyes shifted slightly from me to the guide just behind me. It seemed like slow motion. I remember the feel of the serrations on the rifle’s safety against my thumb. “Safety is off,” I thought to myself. I could see the red fiber optic front sight come into my field of view on the forward part of the bear as his trajectory slightly changed to a path which would lead him to jump on my assistant. “Aim straight,” I heard myself think. I pulled the trigger. The 260-grain bullet struck the charging bear where the neck and shoulder meet. The bear crumpled. One more shot into his back and the 10-foot bear was dead three long steps away at the edge of the snow patch. Like I said before, this was not an uncommon occurrence before switching to a “Better Bear Gun” but since the switch this scenario has not been replayed. Are ARs effective? You betcha! Will I ever go back to World War I technology? No way, no how. This article appeared in AR Guns & Hunting. Subscribe for FREE.